Upgrading your virtual infrastructure to vSphere? Be sure to check out this handy reference from VMware: vSphere Upgrade Prerequisites Checklist. There are several areas which need to be considered and this document covers them all, including both requirements and recommendations. If you’re a consultant who visits new customer sites on a regular basis, it wouldn’t be a bad idea to bring this with to each engagement, or at least a condensed version of it. I had heard VMware Workstation 7.1 was released. Unfortunately, the VMware Workstation “check for updates” feature doesn’t seem to be serving its intended purpose as it told me no updates were available. I hope the usability experience is better than my upgrade experience. I realize some of the reboot business is on the Microsoft Windows 7 operating system but come on, would someone please figure this out? Is there no way to perform an in place upgrade of Workstation to minimize the reboots to one? •Support for 8 virtual processors (or 8 virtual cores) and 2 TB virtual disks. •Support for OpenGL 2.1 for Windows Vista and Windows 7 guests. •Greatly improved DirectX 9.0 graphics performance for Windows Vista and Windows 7 guests. Up to 2x faster than Workstation 7. •Launch virtualized applications directly from the Windows 7 taskbar to create a seamless experience between applications in your virtual machines and the desktop. •Optimized performance for Intel’s Core i3, i5, i7 processor family for faster virtual machine encryption and decryption. •Support for more Host and Guest Operating Systems, including: Hosts: Windows 2008 R2, Ubuntu 10.04, RHEL 5.4, and more Guests: Fedora 12, Ubuntu 10.04, RHEL 5.4, SEL 11 SP1, and more. •Now includes built in Automatic Updates feature to check, download, and install VMware Workstation updates. •Ability to import and export Open Virtualization Format (OVF 1.0) packaged virtual machines and upload directly to VMware vSphere, the industry’s best platform for building cloud infrastructures. Some time ago, I became aware of an ESX 3.5.0 Update 2 (build 110268) host which had 128GB of RAM physically installed, but only 64GB RAM usable. The host was showing 128GB of RAM, however, it was consuming 64GB of memory with no running VMs, leaving the other 64GB of RAM addressable for virtual machines. After further research, it was determined that this host build did not contain the VMkernel change required to properly acknowledge the amount of physical memory installed on the IBM host hardware. The boot option force36BitMTRRMask is no longer required because of BIOS MTRR issues on certain platforms, ESX Server hosts previously failed to boot unless the VMkernel force36BitMTRRMask boot option was set to false. ESX 3.5 Update 3 enables full support for memory up to 64GB with no need to specify a boot option. As a result of this change, the force36BitMTRRMask VMkernel boot option is no longer supported. If the option is set, the result is no operation (NOP) and boot succeeds. 2 ) To utilize more than 64GB of RAM, use a larger MTRR mask by disabling VMkernel.Boot.force36BitMTRRMask from the advanced settings. Deselect the option for VMkernel.Boot.force36BitMTRRMask . Reboot the ESX Server host for the change to take effect. This information is perhaps a bit dated, but I know there are some older 3.x environments still in existence. If those environments are running on host hardware with more than 64GB of RAM installed, this could prove to be insightful. 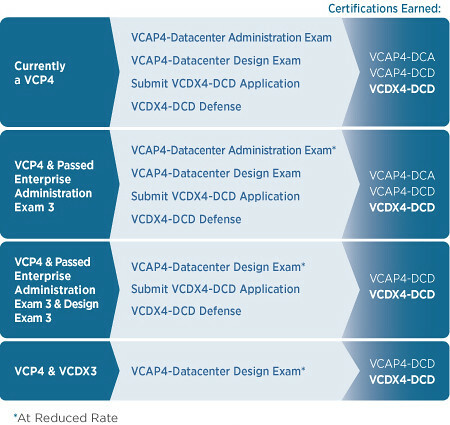 The VCAP is directly related to VCDX4 certification in that both exams are required for candidates which are not already VCDX3 certified (also note that VCP4 is required to sit either of the two new VCAP exams). In other words, the DCA and DCD exams are the VCDX4 version of written exams which map respectively to the Enterprise Administration and the Design exam which VCDX3 candidates would have sat. Update 5/26/10: According to the VMTN Roundtable podcast today, the VCAP-DCA exam will be available in July and the VCAP-DCD exam will be available in August. I was reminded by today’s vCalendar page that vSphere was launched by VMware one year ago today. 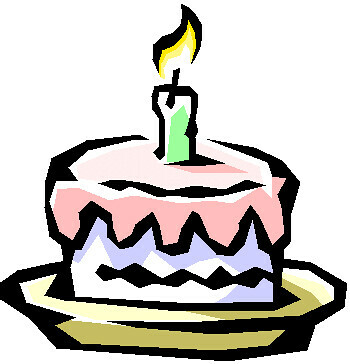 Happy Birthday Buddy – you set the bar which all other hypervisors aspire to be at one day. On this day in 2009, VMware vSphere, the next generation datacenter virtualization product and successor to Virtual Infrastructure 3 (VI3), was released boasting approximately 150 new features, new license tiers, and an amazing 350,000 I/O operations per second (IOPS). vSphere is a 64-bit only ESX host OS. Don’t have a vCalendar yet? Get one! KendrickColeman.com has compiled a nice list of no-cost VMware vSphere utilities. A grading scale was disclosed to provide a value ranking of the utilities. Information like this is valuable because I often see questions raised in the virtualization community about low-cost or no-cost ways to do this or that with VMware virtual infrastructure (backup is a frequent request). I will be the first to admit that lab time is precious. KendrickColeman.com has used their free time to install, test, and summarize each application for the benefit of the community. Nice job and on behalf of the virtualization community, Thank You! Speaking of free, KendirckColeman.com has also pointed to a VMTN forum member who stumbled onto a way to use a free ESXi 4.0 license key to permanently license ESX 4.0. Interesting find there.